Nineteen players came out for Finals and David Lee is our new champion! This is David’s second season win! Congrats to David! David wins a plaque, and Iron Maiden translite and a t shirt. Time Attack Side Challenge: Alex defeats Alissa and wins a shirt and socks! One-handed, one-ball Side Challenge: Potter defeats Alex and wins a shirt and socks! Challenge for perfect attendance and previous side challenge winners: Potter wins a Ghostbuster’s translite. Raffle for side challenge entries: David Brady wins a STERN translite, Kathy wins a T Shirt. Season 6 starts in January and is open to players of all levels. 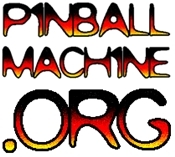 The Pacific Pinball League is in its 5th Season. Open to all skill levels. Entry is $10 and all games on Free Play. Wednesdays at 7PM.